The stakes season’s start at the Meadowlands and although it was hard to go beyond the choices for us, we wound up with only one winner from the legs. Bestyetjet wound up the choice in the first of the Clyde Hirt chapters, paying $5.60. The other contender we gave you in that leg, Connery Blue Chip, finished third. 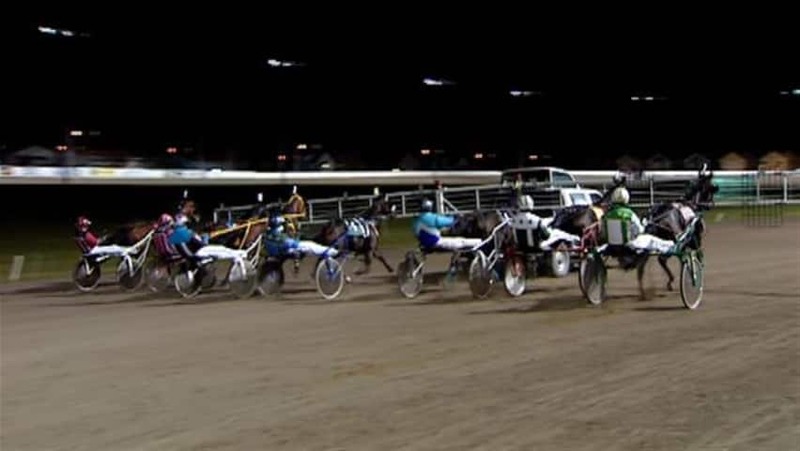 In the opening of the Presidential Series for older male pacers, Meirs Hanover finished third to Golden Receiver, the humongous choice, and Mr Hasani was third in the second leg. The horses-to-watch (H2W) list was busy again this week. A huge percentage of the horses listed finish in the money (this week’s winners below) as well as many have returned to win after appearing for the second (and last) time. As we announced last week, we are keeping the H2W active as we continue to publish our blogs this winter. This TwinSpires harness source is the most valuable harness-betting blog on the Internet. Stay with us, sensationalize on our suggested contenders and stay with TwinSpires to get the best coverage of harness action. Don’t Point At returned to the list after finishing second last week at the Meadowlands. Also winning from the list in their second appearance were Sand Latte and Mousseline Hanover. Some closing odds were not available at press time. 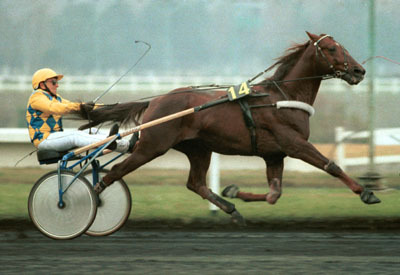 Ourasi (or-oss-ee), arguably one of the greatest trotters of all time, is dead. The international harness champion, a treasure of France to the extent that the country built a statue of him for public display, was a remarkable 32-years-old. Ourasi won $3 million in his career, which included four wins of the coveted Prix d’Amerique, more than any other horse. The fourth win came in 1990 when he was a 10-year-old. He was trained most of his career by Jean-René Gougeon, who suffered a stroke prior to Ourasi’s fourth Prix d’Amerique victory, which had Gougeon's brother, Minou, driving. Oddly enough, the great male trotter tanked at stud, having only 38 foals in 10 years. This allowed for his return to racing, where he sparkled after his retirement failed to spread the remarkable blood through the legions of French trotters (there are no pacers in France). Ourasi died quietly while retired from racing and living in Normandy. According to sournces in France, fans never stopped going to visit hime and pay homage to his heroic racing campaigns. We hope to be adding Buffalo Raceway to the H2W now that its 2013 season is in progress. The season continues each Wednesday, Friday, and Saturday. The first post Wednesday is at 5 p.m. and features a $5,000 Guaranteed Pick 4 Pool. Friday and Saturday evenings the first post is at 6:40 p.m. The new faces campaigning at the New York track are further testimonies to how the Empire State’s harness racing continues thrive (recently, Brian Sears elected to make his home at Yonkers as the Meadowlands opened its first season under new management). Drivers Dan Noble and Shawn Gray made a lot of noice last year, taking take top honors in the drivers’ standings. Gray became the first regular to earn over a million dollars in one season and Noble reached $800,000 in his first season of local action. Now, Billy Dobson, Fern Paquet, Jr. and Ronnie Wrenn, Jr. are on the programs. Dobson, a Michigan native, has been the leading driver at Saratoga Raceway the last three seasons and will be a Buffalo regular “until Saratoga opens back up in early March,” he said. It’s the good purse money and the best place to be in New York, he said. Wrenn, also from Michigan, has branched out to enjoy being on or near the top of drivers’ standings at Northfield Park in Ohio and Running Aces in Minnesota over the last several months. Michigan harness is limping through bad times and Wrenn is one member of the state’s horseman exodus. Another newcomer is Greg Merton, one of the perennial top guns at Monticello Raceway, where he finished as the leading percentage driver in 2012. He is taking advantage of the New York binge by racing at Monticello Monday through Thursday and at Buffalo on Fridays and Saturdays. Merton has been driving for the barns of David Sabatelli and John Mungillo. Another newcomer is a 19-year-old, Tyler Smith, from Ohio. He said he plans to spend Saturday nights at Buffalo. An up-and-coming star in the sport, Smith has been tallying wins in Indiana, Kentucky and Ohio over the last couple of seasons. He is now near than 300 wins shy of reaching 1,000 wins, which would make him the youngest driver in history to accomplish the feat.